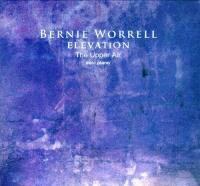 For Elevation: The Upper Air, Bernie Worrell leaves the funk at home. Light years away. Watching Parliament play in the late '90s, I never would have guessed that an album like Elevation: The Upper Air would have come from one of the loudly-dressed, middle-aged gentlemen dancing next to George Clinton. Keyboardist Bernie Worrell's solo career has, overall, not fallen far from the Parliament/Funkadelic tree -- until now. Elevation: The Upper Air is not so much a solo album as it is recorded meditation. With just a piano, a handful of originals and some startlingly reflective interpretations of tunes by John Coltrane, Charles Mingus, Boby Marley and Joe Zawinul among others, Worrell holds your hand through probably the most serene garden of classically-trained piano jazz to come from a '70s funk collective. But with the Worrell name comes expectations. Some will surrender to the album's beauty with little convincing, but others won't be able to handle the minimal touch. When Dave Brubeck did it, everyone was cool with it. But Bernie Worrell? That's surprising -- especially with Bill Laswell producing.